Right, that’s it. I have HAD it with nighties. In fact all bloody silly night dresses of all forms; wispy, silky, clinging, spaghetti-strapped, long cotton with pretty embroidery, delicate, immensely irritating bloody nighties. No more! They are just not safe night wear. You see a couple of nights ago, Grace and I were woken by suspicious crashing noises coming from the garden. Grace leaps up and dashes for the back door with me on her tail, desperately flicking on all the lights in the flat. ‘Let me at ‘em,’ growls Grace, pretending to be three times her size and when I open the back door a crack she pushes past and hurtles barking into the treacle blackness of the garden. I am left peering blindly into the pitch black, terrified that Grace will get hurt or that I will get rushed by whoever is trying to clamber drunkenly over the back fence. It is then I realise that, back lit by the lights in the living room, I am standing at the French doors in a nightie now utterly transparent. Must have been one hell of a scary sight because silence now floods the garden. I am still standing clinging to the door, trying in vain to retain some dignity, when Grace trots back in. She pauses momentarily raising eyebrows at me then shakes her head as if to say ‘you just can’t get the staff these days’, and lopes off to bed. Pyjamas are the way forward. In fact, due to having a terrible head cold the other weekend, I was too befuddled to pack a bag correctly and hence arrived to give an after dinner speech without the correct trousers (Gromit!) I ended up standing in front of 140 people to give a talk in my pyjama bottoms. Luckily they weren’t the fluffy ones or the ones with little love hearts on the arse but just saying. I couldn’t have done THAT in a nightie! 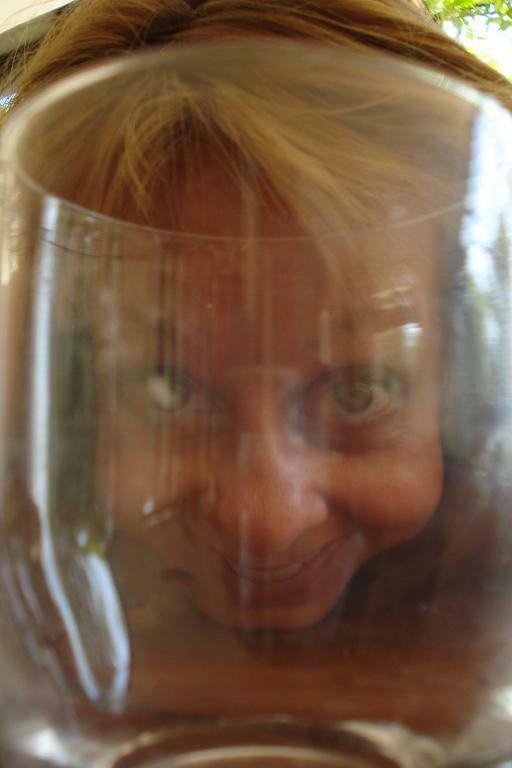 Self Portrait with du vin. No one would have noticed either except that, after said talk and to calm myself I downed several glasses of ‘medicinal’ whisky and, all snotty nose and lozenge breath, leaned unsteadily into the handsome man on my right and hissed ‘Guess what…I am so easy to get into bed I am already in my pyjamas!’ before winking one gruesome red rimmed eye and blowing my nose in a come-hither kind of a way. Whatever your night wear, thank you for patiently waiting for me to get my blog brain back in gear. I aim to keep my posts shorter but more regular from now on. After all we have a hell of a lot to catch up on! How have you all been? Oh wow I'm totally doomed. I wear a men's tank t-shirt to bed (what do you guys call those – it's an undershirt?). That would give any would-be intruders a heart attack. And be no help at all if I forgot my trousers! Great to see you back again!! Your post made me smile, as usual..
Hey y'all! Thanks so much for stopping by and I do apologise for the latemness of this 'ta much' comment from me! Have had a couple of minor problems with the site but seems fine now. Much love and more posts a-coming.